There's nothing better than the smooth, luxurious texture of chocolate pudding. But the store-bought kind can contain artificial ingredients as well as way too much sugar. For example, one half-cup serving of Kozy Shack chocolate pudding has 22 grams of sugar, not to mention that sugar is the second most predominant ingredient in the product (after reduced fat milk). So we decided to develop a healthy, vegan dark chocolate pudding that's around 200 calories per one-cup serving and contains no more than 12 grams of sugar. The American Heart Association recommends that women consume no more than 24 grams of sugar per day, and that men consume no more than 36 grams of sugar per day. Another awesome thing about this pudding: it's made from a super unexpected, heart-healthy ingredient: avocado. The AHA recommends avocados as a source of monounsaturated fat, so you don't have to be concerned about the 13 grams total fat in this recipe. Monounsaturated fats help to reduce your risk of heart disease and stroke by lowering your LDL cholesterol levels (LDL is the "bad" kind of cholesterol, for the record). 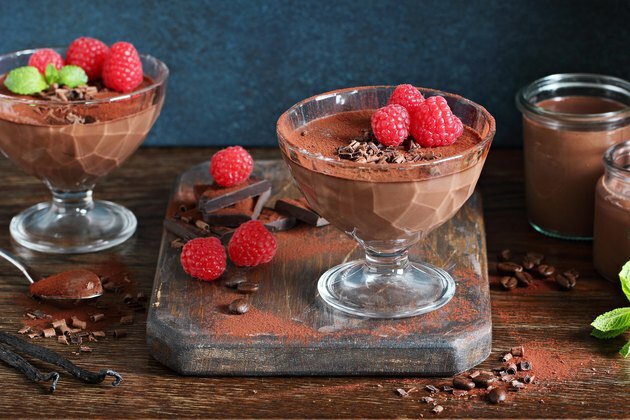 The best part of this rich, silky vegan chocolate pudding — other than the unexpected use of everyone's favorite ingredient — is that it requires no cooking, and it’s ready to eat in about five minutes or less. Try whipping it up the next time a serious chocolate craving strikes.